Splash! 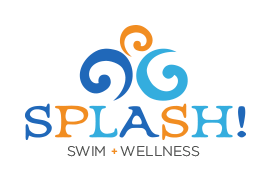 Swim + Wellness is 1 of the only pools in the state of Wisconsin that has an official USMS Certified ALTS (Adult-Learn-To-Swim) Instructor. 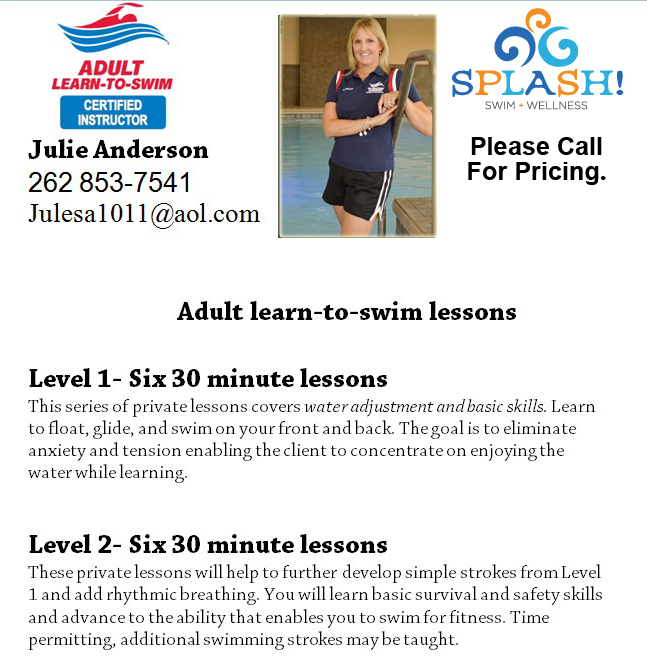 Julie comes to us as our first “Adult Learn To Swim” certified instructor. She had extensive training through US Masters Swimming, and specializes in teaching adults who are fearful of the water how to swim by integrating yoga based breathing and relaxation techniques. Julie was a high school swimmer and All-American swimmer at University of Wisconsin-Eau Claire. After a career as a Pediatric RN, and raising 3 children, she returned to competitive swimming in 2014 and competed at US Masters Nationals. That same year, she placed in the top 50 in breaststroke at the FINA World Championships. 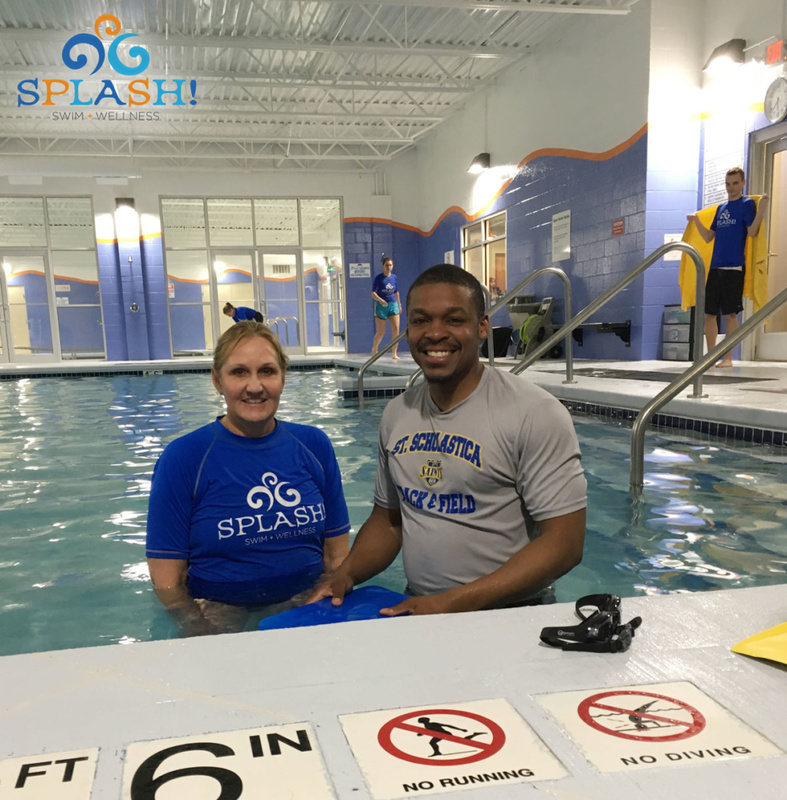 In addition to working with non-swimmers, she is also certified to teach stroke technique and refinement. She holds certifications in Lifeguarding, Water Safety Instructor, CPR/ first aid/AED and BLS/CPR for Healthcare providers. Julie won 2 events in the 2017 Arizona Senior Olympics, and then completed another triathlon! She is such an inspiration to us all. More updates coming soon! “Adults aspire to SWIM more than any other activity…. yet 37% cannot SWIM the length of a pool.” (USMS & The CDC – Center for Disease Control and Prevention) There are more than 18 million swimming pools and hot tubs in the USA – and our planet is about 71% water! So swimming is a life-saving skill you need to have as an adult. Sadly, every day about 10 people die from drowning. The majority of unintentional drowning victims are adults. Also, research shows that children of adults who don’t know how to swim, are at a greater risk of not learning to swim as well. It’s not too late to learn how to swim! Please give a call to learn more!